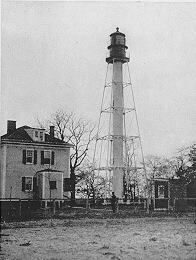 The Waackaack Rear Range Light was built on land acquired from Andrew Wilson on April 6, 1854. The tract was about 2 acres and went from the present Frances Place [whether a road or a house is not apparent] down the west side of Waackaack Avenue to Kennedy Way [formerly Fourth Street] west on Kennedy to Creek Road, south on Creek Road back to Frances Place. Some of the land was later sold off to the firm of Redfern & Wilson. In 1856, the 96 foot tall Waackaack Range tower was completed. It stood near the waters edge but was the rear range light in conjunction with the Point Comfort light on the beach. The light's main purpose was to guide vessels coming into the Raritan Bay. The tower was initially made of wood but was replaced in the 1860's by an iron tower made by the Russel Iron Works. ...elevation of tower 68 feet, light stands 76 feet, a 2nd order fixed white light at 40°26'36" Latitude by 74°08'11" Longitude. A white tower with black lantern. The light was first fueled with lard oil, but in 1883 a high powered electric lamp was installed that was magnified by a glass lens manufactured by F. Barbier of Paris, France. According to Mr. Redfern, who purchased most of the lands adjacent to the lighthouse, the first keeper of the lighthouse was Cornelius Collins. The second keeper was William Chadwick, who worked with Steve Wilson as his Assistant Keeper. Mr. Fowler followed William Chadwick as keeper. Preparations were made to replace the light tower beginning in 1891. It is noted in the Annual Report of the Lighthouse Board for Fiscal Year ending June 30, 1891 "that the preliminary levels and surveys were made preparatory to carrying out the provisions made by Congress in the act approved on March 3, 1891 for erecting a new tower at this point." The tower built for use at the Waackaack Rear Range Light Station was part of the United States Lighthouse Board's exhibit at the World's Columbian Exposition held in Chicago in 1893. The lighthouse was built of iron rings, by a contractor from Detroit, Michigan. As the site for the lighthouse was not ready for its erection at the time the light tower was completed, it became possible for the lighthouse to become an exhibit at the Exposition. The Waackaack light tower is an iron skeleton structure surmounted by a parapet and lantern, accessible from below by a spiral stairway inclosed [sic] in an iron cylinder. Its height from base to lantern top is 106 feet and its weight is about 150,000 pounds. The skeleton structure which rests on eight circular foundation disks, anchored to a concrete foundation, is composed of columns, sockets, struts, and tension rods, forming the frustum of a square pyramid, bounded on the top by an architrave supporting an octagonal gallery, a circular parapet and a decagonal lantern. The frustum has a base of 28 square feet; its height is 84 feet to the lower face of the architrave, where its sides form a square of 8 feet 8.66 inches on each side. The wrought iron to be used for the structure must be free from imperfections, and must be capable of bearing a tensile strain of not less than 50,000 pounds per square inch of cross section. All castings must be entirely free from imperfections such as honeycomb, blowholes, etc. : they must be straight, out of wind, and must have a clean and smooth surface. The iron in the castings must be light gray in color, close grained, and of such quality that a rough bar three fourth inch square, supported at points 12 inches apart, will break under a load of not less than 930 pounds applied at the center. The agent of the Light-House Board in charge of the work may test specimens of the iron by straining or breaking, but no piece that has been strained and possibly crippled shall be used in the structure. The tests referred to shall be at the expense of the contractor. The bolt heads and nuts throughout the structure are to be hexagonal, if not otherwise specified. The screw threads must be sharp and clean and the bolts of proper lengths. The diamond checkering, wherever specified, is to be at an angle of 30°; to one side of the plate, the checkers not any longer than 1¼ inches. The brass must contain not less than 90 percent of copper; it must have a close texture and no scrap is to be used in the alloy. None but the best workmanship will pass inspection. The contract price for the iron tower was $11,810 which included erection of the tower on its own foundation. The government was to provide the illuminating apparatus, lantern glass, and prepare the foundation of the lighthouse. The lighting apparatus used in the iron tower was also part of the exhibit. The lens, with its mountings was about 7 feet high. It had an interior diameter of about 60 inches. It was lighted by a four wick burner with a reflector behind the lamp. The beam of light was "too bright to be borne by unprotected eyes except from a distance." It was seldom lighted during the exhibit. When the town of Keansburg officially incorporated as a Borough in 1917, it adopted the outline of the Waackaack Range Light as its seal. The design has changed a little through the years, the light rays formerly came out of the tower only on the right side, but in the 1930's light rays were added to the left side of the seal and shrubs were added around the base to give the seal a fuller appearance. The eventual dismantling of the Waackaack Lighthouse was heart-breaking to many residents, as the Government gave the Borough just one chance at obtaining the lighthouse for a landmark prior to putting the lighthouse up for sale as scrap. It is unfortunate that the paperwork could not be prepared in time to save the light. In 1955, the lighthouse was put on the auction block, but the lone bid for the tower, $280.00 was rejected by the Government. By the end of the 1950's, the lighthouse was no more.